APLS Thermal Guard Mylar is a portable and disposable absorbent litter that provides maximum thermal protection during emergency transport. APLS Thermal Guard Mylar provides an integrated system for improved patient care – the highly absorbent cellulose core wicks fluids away from the patient, the Mylar-lined bag and detachable hood retain body heat, and the treated nylon backing protects against wind and moisture. Eight closable access points enable medical personnel to better treat the patient at point of injury. 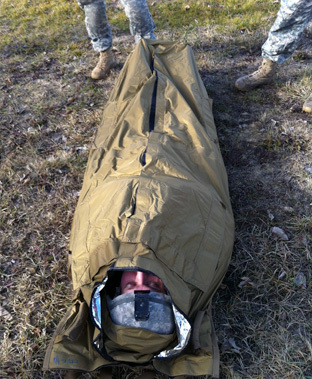 APLS Thermal Guard Mylar can retain 1.7 liters of bodily fluid while safely supporting up to 350 pounds. APLS Thermal Guard Mylar is a unique poleless litter that protects patients from hypothermia during emergency transport. Photo Courtesy of U.S. Air Force by Senior Airman Juan Duenas.